Pre-Primary Class: This program is for children 18 months to 3 years of age. The child is introduced to “in-school experiences.” The student is introduced to basic concepts of language (phonics), mathematics (numbers and quantities), geometric shapes and lines, colors, arts & crafts, music and gymnastics. The child is encouraged to explore a primed environment and gain sensory stimulation and cultivate social skills. A basic foundation is prepared upon which the child cultivates the necessary building blocks for a successful scholastic future. The teacher-child ratio is 1:8. Intermediate Class: This program is geared for students 3 to 4 years of age. The intermediate program is equipped to build upon the foundation prepared at the pre-primary level. The class is set up to encourage students to explore all the material in the class. New and engaging Montessori materials are introduced catering to a high level of interaction between instructor and student. Students are intrigued with the educational material and ask questions in turn fostering a fertile learning environment. The instructor capitalizes on this urge for information by introducing new and challenging concepts to the students. 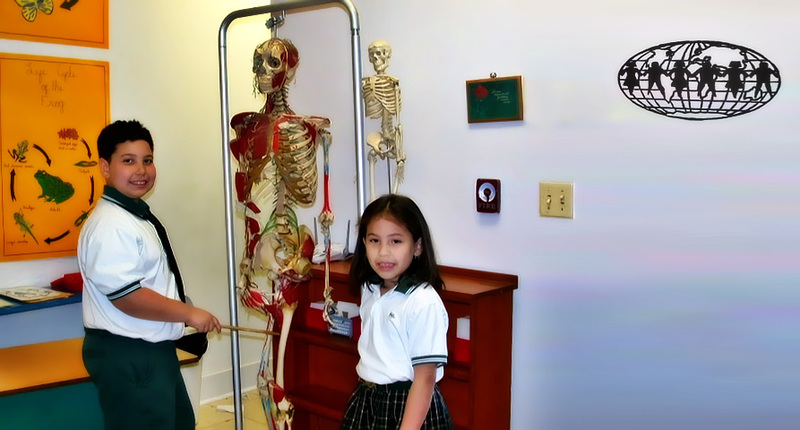 The two key aspects of Montessori education are introduced, Practical life and Sensorial. The teacher-child ratio is 1:12, providing generous one on one attention. Primary Class: The primary class is for students 5 to 6 years of age. The environment is equipped to meet specific developmental needs of the child. The teacher acts as a guide to continuously observe the student’s activity. The teacher is the link that connects the child to their environment. The activities performed in class are repeated on a higher and broader scope as the child moves through the different developmental stages. It is in the primary class, where the two most important aspects of Montessori education are ingrained, practical life and sensorial. The teacher-child ratio is 1:15.